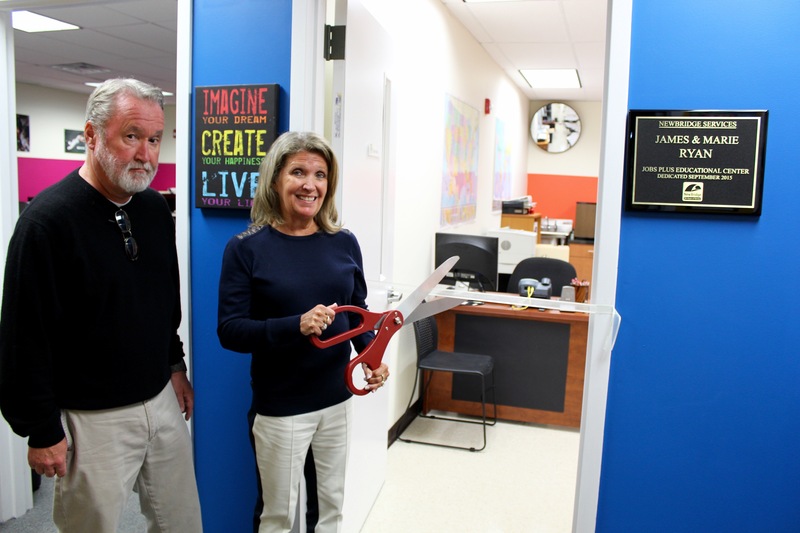 NewBridge Services dedicated a classroom for its alternative education program to the memory of founder James Ryan and his wife, Marie, at the nonprofit’s new location in Parsippany on Sept. 29. 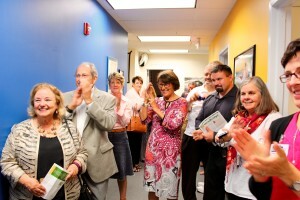 The ceremony, attended by more than 40 guests, took place during an open house at the nonprofit’s 15,320-square-foot, centralized service center, which opened in August and provides counseling, substance abuse treatment to Morris County residents. Located in the in the Troy Office Center off eastbound Route 46, the facility has 20 counseling rooms and spacious group therapy rooms, as well as a drop-in center for clients. It’s also the new home of NewBridge Jobs Plus, a free program that has helped more than 3,000 young adults earn their high school diplomas and prepare for careers. Guests cheered as founder Jim Ryan’s daughter, Debbie King, and her husband, George, cut the ribbon on the entrance to one of two NewBridge Jobs Plus classrooms. Ryan was a decorated World War II veteran who recognized the need for community-based mental health services in Pequannock Township and surrounding towns, and worked with his pastor at the First Reformed Church of Pompton Plains and three others to create the Pequannock Valley Mental Health Center in 1963. The PVMHC later changed its name to NewBridge Services to reflect its expanded services and coverage area. NewBridge now serves more than 8,500 people each year in Morris, Passaic and Sussex counties, and beyond. Ryan served as president of the NewBridge board of trustees and on other committees, and remained an avid supporter until his death in 2005, at age 84. Debbie and George King donated $5,000 to support NewBridge Jobs Plus and her employer, Bloomingdales, made a matching donation. “We’re proud to continue to build on Jim Ryan’s vision to build strong communities,’’ Parker said. The youth group at Grace Bible Church of Pompton Plains raised $400 for NewBridge Jobs Plus to buy a tablet, said Amy Sheppard, supervisor of the program. Members of the church presented a check to NewBridge yesterday.